DO THE SCOOTERS HAVE A WARRANTY? 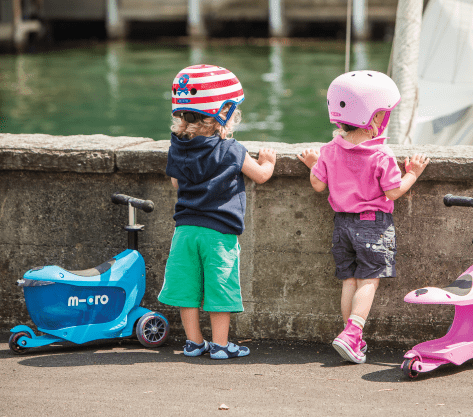 All of our scooters and kickboards include a 2-year warranty against manufacturer defects. This applies also to sale items. Our warranty is valid for 2 years from the date of purchase. It protects against manufacturing defects and faults in craftsmanship but does not cover any damages incurred via improper use (such as jumps, tricks, or other aggressive use). Also, general wear and tear is not considered a warranty consideration as the scooters’ wheels and moving parts will wear down over time with standard use. HOW DO I GET MY SCOOTER FIXED UNDER WARRANTY? To claim on your warranty please contact us. You will need to provide pictures of any damage and your proof of purchase so we can review your claim. We also need the serial number of your scooter, which depending on the model is either on the underside of the lower deck, or on the folding block. It is usually 9-10 digits made up of letters and numbers. MY SCOOTER HAS A BROKEN PART THAT DOES NOT LOOK LIKE IT CAN BE REPARED. WHAT CAN I DO? SHOULD I PURCHASE THE MINI MICRO (AGES 3-5) OR THE MAXI MICRO (AGES 5-12)? MY 4-YEAR-OLD IS BIG FOR HIS/HER AGE. When our scooters are being assembled all the bolts have a thread locking fluid applied to them to ensure that there is minimal loosening and movement of the parts. This can however cause problems when trying to undo the bolts. If you are finding any bolts too tough to move a short, sharp tap with a hammer can be enough to break the seal of the locking fluid and make it a bit easier to handle. You may find you need a little extra force to tighten or undo the bolts, even without locking fluid causing the problem. If you place a short length of pipe or something similar over the handle of the Allen key this should give you the added leverage you need to undo or tighten up any bolt. WHERE DO I GET SPARE PARTS FOR MY SCOOTER? Two of the great things about micro® are that all of our scooters have replacement parts, and they are easy to fix. Replacement parts are available through the parts section of our online store, grouped by scooter model. Check the information on our Maintenance page first. If you have a Mini Micro scooter, repair instruction videos are also available. If that doesn’t help, send us an email explaining the problem and we’ll come back to you asap with a possible solution.